Welcome to San Sebastian, the hometown of two restaurants that rank in the Top 25 of the World’s 50 Best Restaurants and the 15 Michelin Stars shared among its 7 unique gastronomy places. Let yourself drive your passion for good food and exceptional taste flavours to the limits. Let us show you how through an iconic itinerary you will get to know not only San Sebastian but also Bilbao, La Rioja and Barcelona. Four iconic locations in magical Northern Spain have the power to make you feel being a member of their incredible culture, a traveller to walk through their colourful landscapes and a wine taster of the genuine wine art infused with special flavours. Welcome the North side of Spain and experience what Gaudi, Dalí, Miró and Picasso fell in love with: the Spanish art and life. FERRER y SARET crafts an iconic itinerary just for you. Follow it to live the experience. Arrival in Bilbao. An official guide and a driver will be waiting to transfer you to the hotel in Rioja Alavesa, in the heart of the Basque Country. Bilbao was an old fishing port that, a little over a century ago, became the largest iron and steel producer in Spain. Today it is a modern and dynamic place that has become one of southern Europe’s coolest destinations, with the Guggenheim Museum as its postcard attraction. It is time to feel for our first sensations on the trip to Rioja Alavesa. After leaving Bilbao, the landscape is decorated with rolling green hills until you reach the wine country. Then we will check in at the accommodation, a 5-star hotel that combines modernity with tradition. A sense of wellbeing pervades everything in here. An omen that something great is about to happen. Who isn’t familiar with the wines of Rioja? More than 500 wineries, which are scattered across the South of the Basque Country (Álava), Navarre and the region of La Rioja, protect the secret of one of the best wines in Europe, known for its superb quality, aroma, balanced composition and bouquet. The Marqués de Riscal, one of the most iconic wineries, awaits our arrival in the morning. 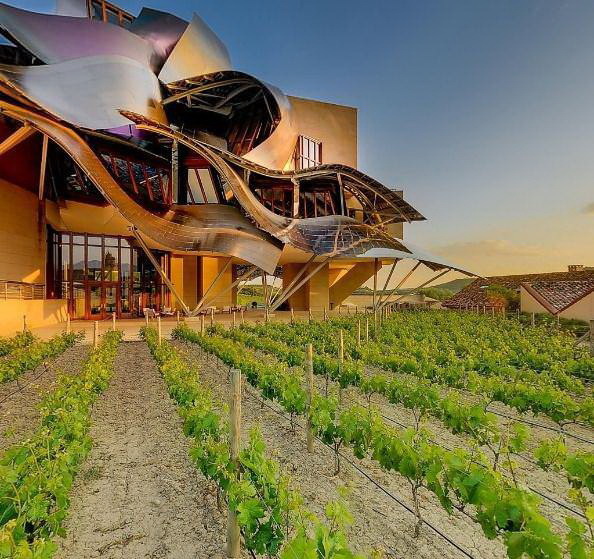 In addition to concealing some of the most prestigious Rioja wines, this location gives visitors a unique opportunity to contemplate a genuine work of art, a true 21st century “Cathedral of Wine” designed by the famous Canadian architect Frank Gehry. In the afternoon, following a lunch in the winery, nothing could be better than surrounding ourselves with nature on a walk around the vineyards, and then relaxing in a wonderful Spa that will make you believe that Rioja is in fact another word for a divine blessing. After breakfast, the spirit of Rioja wine will return once again to knock on your door and invite you to visit two other wineries that are representative of this wine-producing area in the South of the Basque Country. The first is a family legacy, where values and culture interconnect in a unique and perfect symbiosis with grapes and wine. The second is an estate that produces one of the finest and most elegant wines in the area. After making these two discoveries, we will have lunch at the Los Arcos restaurant and take a tour of the beautiful medieval town of LaGuardia, a place that has kept the monumental memories of its past almost immaculately preserved. Let us not forget that this was also the birthplace of Félix María de Samaniego, one of the most important authors of fables from Spanish literature. Does the fable of the hen that laid the golden eggs sound familiar to you? LaGuardia is home to an incredible popular culture and important wine traditions. So, dining at a small restaurant in this town, with a friendly and talkative owner, promises to be an unforgettable experience. Day 4. Logrono and San Sebastián: so close, so far away. The Rioja Denomination of Origin owes its name to the region of La Rioja, where an important part of this wine is produced. Therefore, a trip to the heart of this land would be incomplete without a visit to the neighbouring Wine Museum, which houses 7,000 years of viticulture history. 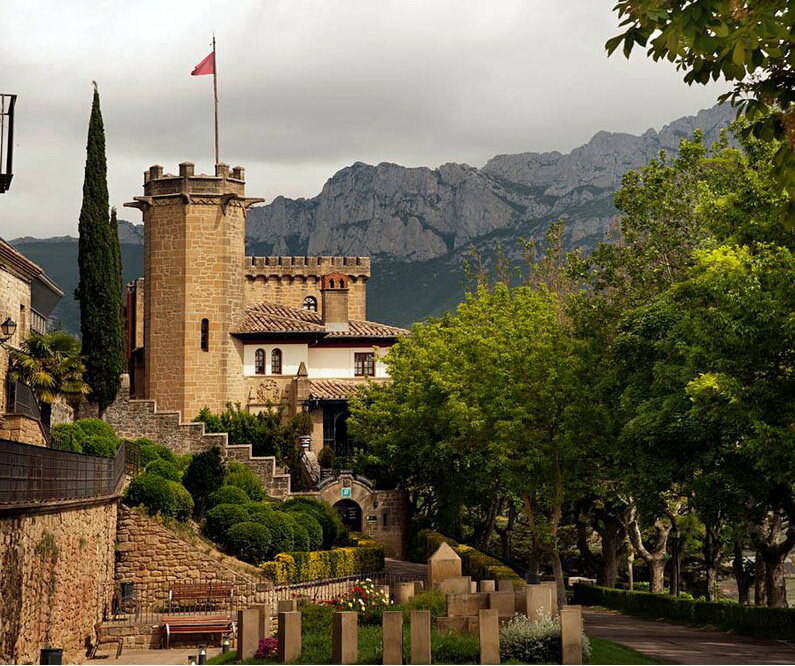 We should not omit Logrono, La Rioja’s capital, where we will sample its famous gastronomy. In the afternoon, we will return to the Basque Country, San Sebastian. 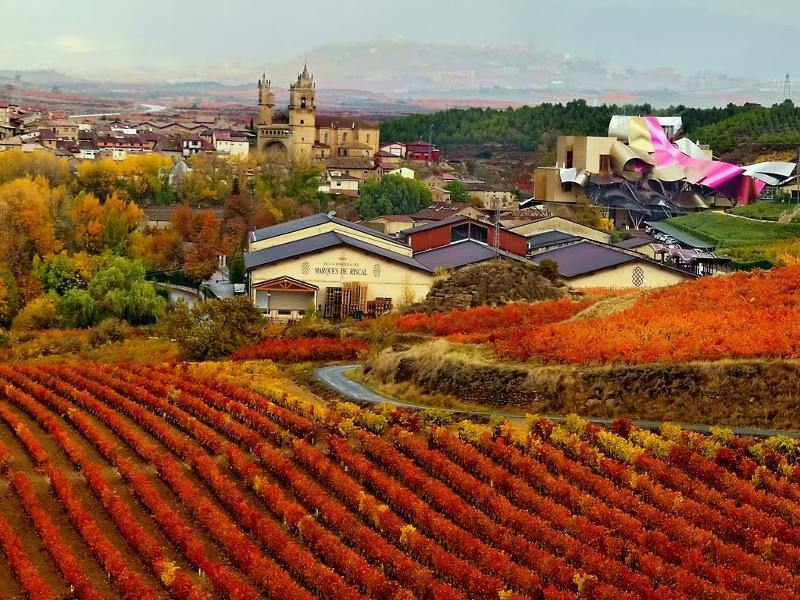 Logrono and this Basque city are twin towns due to their passion for wine and good food, but they have very different landscapes. While Logrono is a little treasure of the Ebro valley, San Sebastian, by the sea, is the pearl of the Basque Country. And as a perfect illustration of this, there is nothing better than dining in one of its most precious jewels: the Michelin 3-star restaurant of chef Juan Mari Arzak. Is it the best restaurant in the Basque Country? We will wait for you to return with your opinions. Meanwhile, you can check in at the hotel. 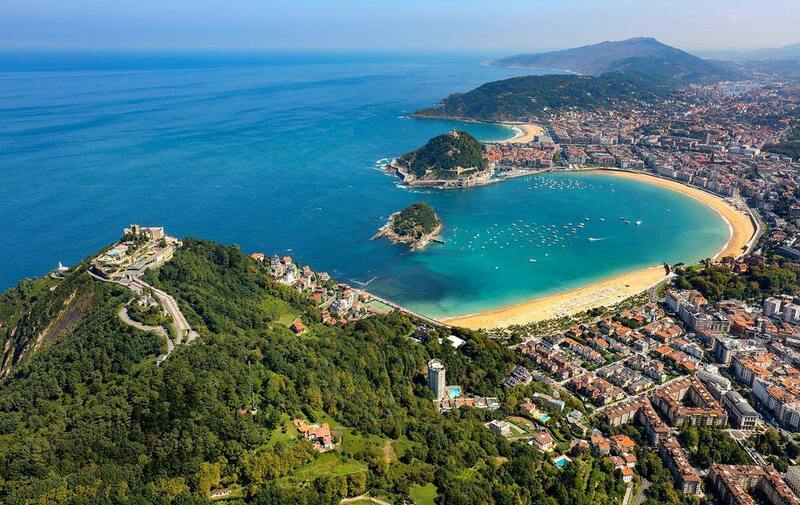 After a buffet-style breakfast, we will take a stroll around San Sebastian to experience its charm: the historic centre, the Urgull and Igueldo mountains, the Miramar Palace and La Concha beach. For years the old Donostia was a summer holiday destination for Spanish royalty, which is why it has become a renowned tourism destination. However, the secret of San Sebastian is not only its façade, but also its essence. The city, which is deeply rooted in its traditions, is also a reflection of modernity, good taste, and above all, a passion for gastronomy. The various gastronomic societies — private clubs where members and friends meet to cook, eat and socialise around the table — are a good example of this. It is an institution that is unique to this place. And of course, we will grasp the opportunity and the privilege to have lunch in one of them. 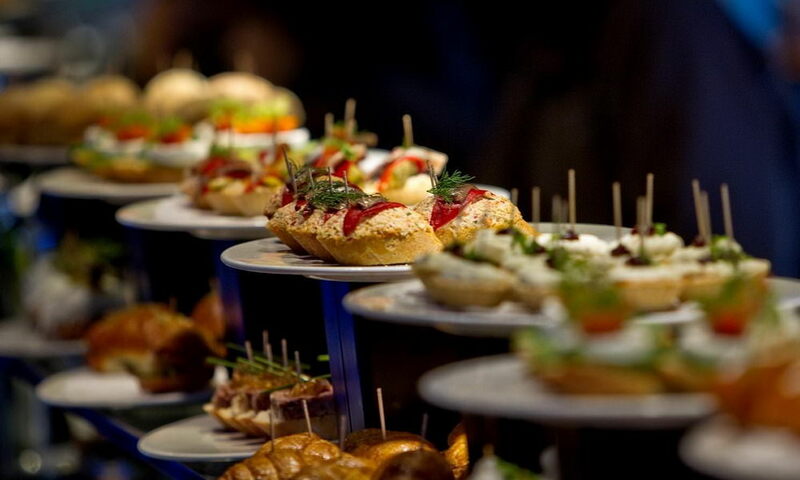 As it is impossible to stay hungry in San Sebastian, in the afternoon, we will head out for “pintxos“, a type of tapas that every bar in the old town cooks using the finest local ingredients. They are, of course, always accompanied by a “zurito” (a small beer), or a “txikito” (a small glass of wine). The Basque people are passionate about the sea. They are brave fishermen and sailors who are constantly dreaming of crossing the waters. They particularly enjoy, in a way what few others do, the fruits of the ocean. Without a doubt, alongside the Japanese, they consume the most fish in their daily diet of any population in the world. This is something that becomes immediately obvious to visitors when they arrive in San Sebastian and its province, Guipúzcoa. So, there is nothing better than taking a trip inside an anchovy factory, where these tasty little blue fish are stored in salt and olive oil. Or you can enjoy the best fresh fish you will ever taste at the Elcano restaurant (1 Michelin star) in the neighbouring town of Getaria. This family owned restaurant is the best grilled fish restaurant in the Basque Country, as it uses only the best quality raw ingredients. But before this delicious lunch, we will enjoy two of the sea’s other gifts. 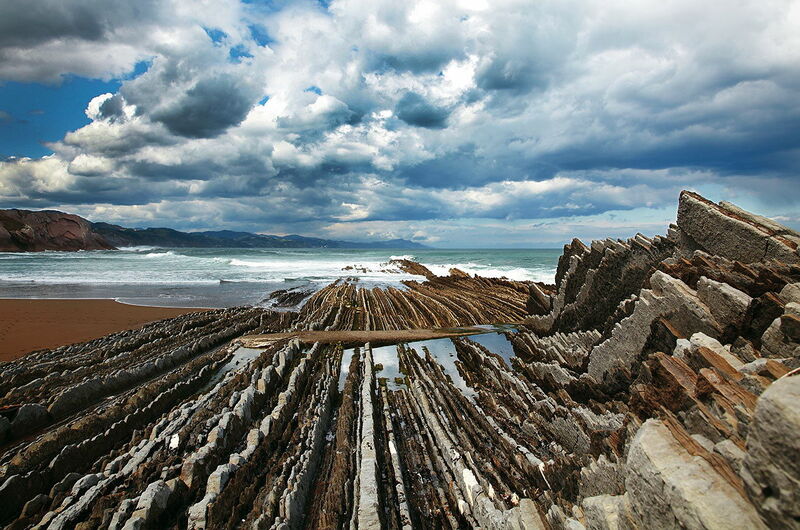 First is the Flysch of Zumaya (a UNESCO World Heritage Site), an area which dates to the age of the dinosaurs where sedimentary layers fold dramatically toward the Atlantic Ocean. It is also a location for the world-famous television series “Game of Thrones”. The second gift is the Txacolí, a unique white wine combined perfectly with fish and cheese. It is made from a local grape (“Hondarribia Zuri”) and has a fresh and fruity bouquet while retaining the salinity of San Sebastián’s beloved sea. We will of course be visiting one of the wineries to make sure that this is true. Everything here is overwhelmed with gastronomy. Therefore, it comes as no surprise that San Sebastian is home of two restaurants that rank in the Top 25 of the World’s 50 Best Restaurants. A phenomenon that otherwise only occurs in Lima, New York and Paris. It also boosts 15 Michelin stars shared among 7 restaurants. On the 4th day we sampled one of these temples of gastronomy that have been awarded with 3 stars. Today we are lucky enough to be having lunch at Azur Mendi (3 Michelin stars). It was not by chance that Eneko Atxa became the youngest chef in the world to achieve the coveted three stars. This passion for good food is closely linked to wine. So, before we go to lunch we will visit the first winery in the world to use the properties of the sea floor to mature and prepare its wine. 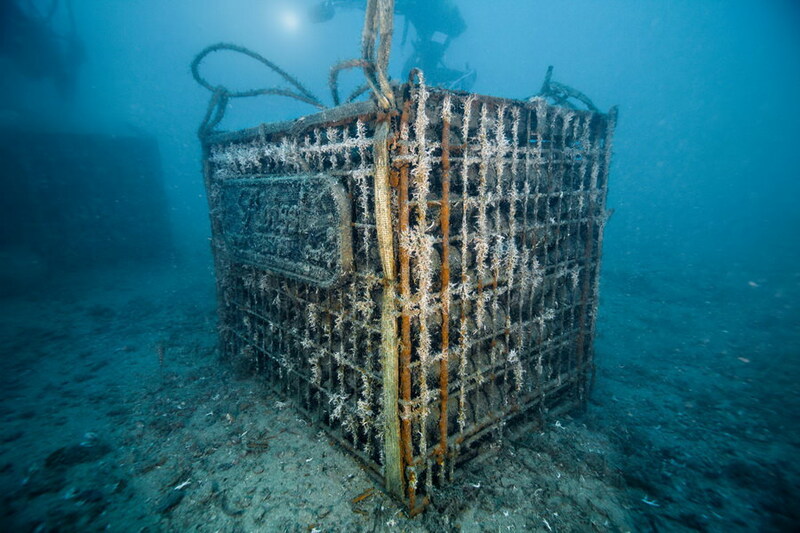 They claim, and confirm scientifically, that the biosphere and the marine environment can bring unique nuances to wine. In the afternoon… another tasting follows! This time it is accompanied by a wine expert who will help us to taste a wide selection of the best Spanish wines. A perfect opportunity to learn how to distinguish nuances, textures, aromas and flavours. And to complete the day, we will have dinner in another San Sebastian flagship, a restaurant that has been open for more than 125 years while always being run by the same family. It offers a combination of avant-garde and traditional Basque cuisine. The chef decides upon the menu each day depending on which fish, meats and vegetables are the freshest in the market, so we will not know what is on the menu until we sit down at the table. Álava, Guipúzcoa… now it is Vizcaya’s turn as the territory that completes the trio that makes up the Basque Country. Almost hundred kilometres East of San Sebastián lies Bilbao, the Biscayan capital, which has become a design and architectural mecca. Its great centrepiece undoubtedly being The Guggenheim Museum, a glittering titanium structure which evokes the shape of a ship dazzling the city. We have already sampled Bilbao’s initial sensations on the day we arrived. However, today we propose a private guided tour to its spectacular museum, an institution that presides over the Basque culture and houses considered to be the best contemporary art on the planet. 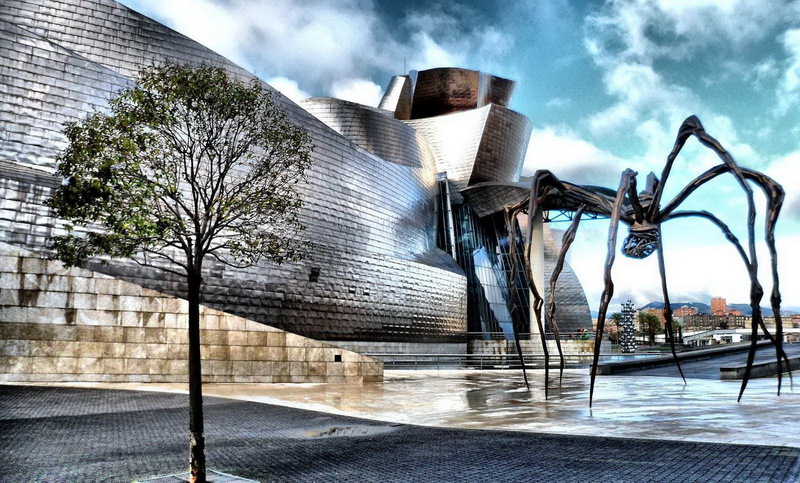 After visiting the Guggenheim, we will move on to Bilbao airport to catch a one-hour flight to Barcelona, another city by the sea, the Mediterranean Sea. 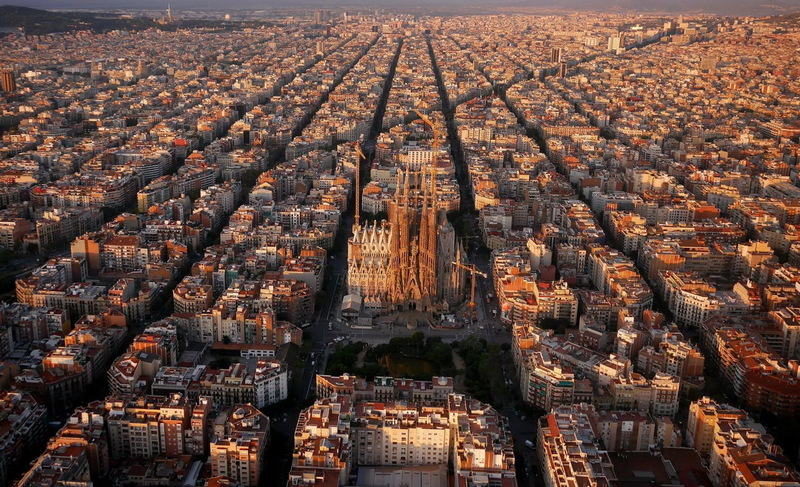 Upon arrival, we will check in at the hotel and go for a panoramic tour of the Catalan capital. After discovering its main attractions, we will take a walking tour through the Gothic Quarter to admire the medieval splendour of Barcelona, its markets and of course the deeply ingrained taste of the sea. To ensure the aroma accompanies you, there is nothing better than dining at the modern Club, located in the marina of the old port. The colors of the Mediterranean shine with all their splendor in Barcelona, which is due in part to the influence of Antoni Gaudi. He was a genius to decorate this city with magical architecture, fascinating to contemplate causing no doubt love at first sight. We will therefore be taking a Gaudi Tour to feed our fascination. 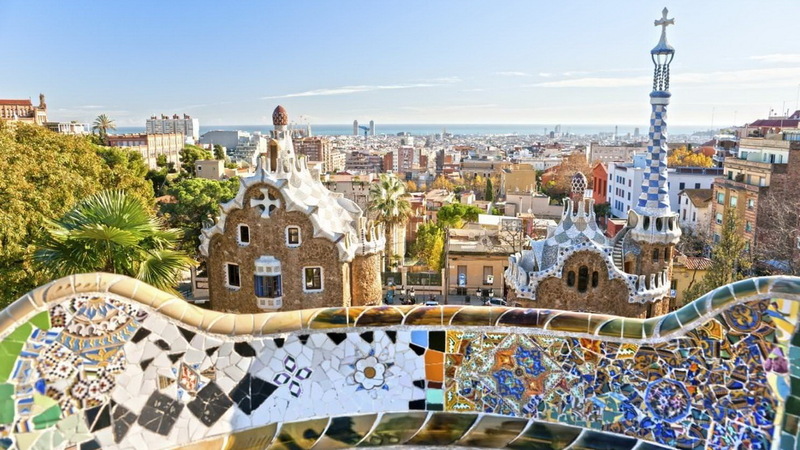 Every amenity will be available to us — in a luxury minibus — and we will be accompanied by a local guide, a photographer and an architecture specialist, so we can learn the secrets behind Barcelona’s magic spell. La Pedrera, Casa Batlló, Park Güell, La Sagrada Familia… be careful, the attraction can be fatal, we may become trapped by Gaudi’s charm for the rest of our lives. Afterwards it will be time for a snack and to sample some tapas — montaditos (small sandwiches), seafood and Iberian ham — in Barcelona’s only tavern that serves restaurant quality food. After lunch, we will head to the shopping paradise of La Roca Village, a shopping city located on the outskirts of Barcelona where you will have a true “shopping experience” with a VIP lounge and a glass of cava wine to welcome you. In Barcelona they say that their main football team is “Més que un Club” (more than a Club), due to the social and cultural implications of its victories and defeats. 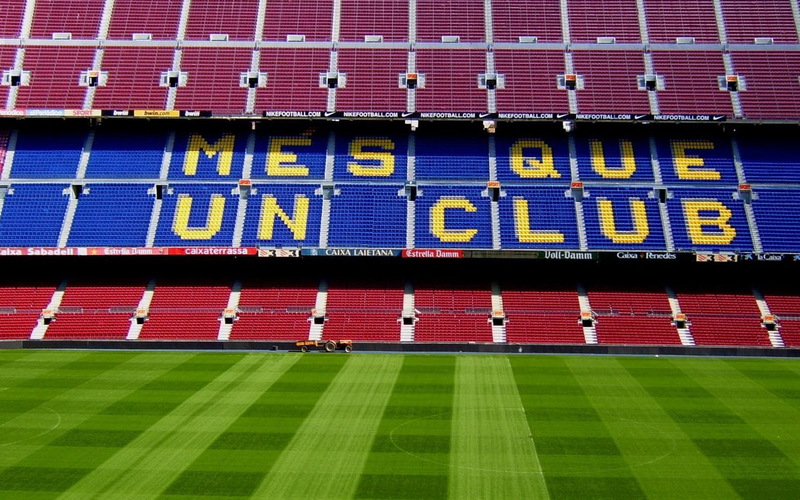 To see for ourselves, we have scheduled a Tour of Camp Nou, a real insight into the world of the Barça stars: Kubala, Cruyff, Maradona, Guardiola, Ronaldinho, Messi and even Suarez. But before we visit the stadium, we need to check whether Barcelona is really “more than a city” by making a stop at Montjuïc, its most iconic and artistic hill. The Montjuïc Tour will include the MNAC, the best museum of Romanesque art in the world; the Mies Van der Rohe Pavilion, a symbol of Bauhaus and the father of modern architecture; not to forget also the Miró Foundation. This location provides a vantage point from which you can enjoy incredible views of the Mediterranean and the city simultaneously, and this experience is even more special from an iconic restaurant where many of Barcelona’s citizens and visitors have pondered whether Barcelona is more than a city. Final impressions from Barcelona; Final sensations from Northern Spain; A journey where the Cantabrian and Mediterranean seas meet each other. A tour full of magic, wine, art, delicious gastronomy; above all though a passion for life. We will end this experience with breakfast at the hotel followed by a minibus transfer to the airport to catch the flight home. As they say in the movie Casablanca: “Louie, I think this is the beginning of a beautiful friendship”.